Melbourne Band 604 the most versatile band in Melbourne. Why choose Melbourne Band 604. Over 25 years experience in performing for crowds up to 3000 persons to small 60 person venues. The most lively dance-able music. Played like the original artists. 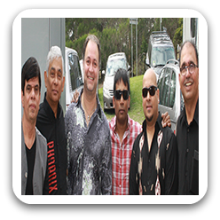 Melbourne Band 604 Guarantee to rock your event or function. Book us now you wont be disappointed.